Superficial, Spreading, Melanoma, SSM, Dermoscopy, Criteria, ABCD, Polygons, Irregular blotch, Irregular dots Superficial Spreading Melanoma – cite! Superficial Spreading Melanoma (message) Superficial Spreading Melanoma – participate! Dermoscopy significantly improves the sensitivityThis glossary term has not yet been described. and specificityThis glossary term has not yet been described. of clinicians for melanoma diagnosisis the identification of the nature and cause of a certain phenomenon. Diagnosis is used in many different disciplines with variations in the use of logic, analytics, and experience to determine "cause and effect". In systems engineering and computer science, it is typically used to determine the causes of symptoms, mitigations, and solutions. The dual benefit of dermoscopyThe examination of [skin lesions] with a 'dermatoscope'. This traditionally consists of a magnifier (typically x10), a non-polarised light source, a transparent plate and a liquid medium between the instrument and the skin, and allows inspection of skin lesions unobstructed by skin surface reflections. Modern dermatoscopes dispense with the use of liquid medium and instead use polarised light to cancel out skin surface reflections. lays on its potential to allow the detection of clinically inconspicuous melanomas, while enabling the recognition of benignis any condition that is harmless in the long run lesions that might look clinically worrisome, reducing, thus, the number of unnecessary excisions. MelanomaThis glossary term has not yet been described. becomes clinically recognizable at a certain progression pointThis glossary term has not yet been described., after acquiring one or more of the ABCDThis glossary term has not yet been described. clinical criteriameasure of how well one variable or set of variables predicts an outcome. At an earlier stage, melanoma is macroscopically undetectable, since it is small in size and symmetric in terms of shape and colorColor (American English) or colour (Commonwealth English) is the characteristic of human visual perception described through color categories, with names such as red, yellow, purple, or blue.. At such an early stage, dermoscopy often uncovers sub-macrosroscopic morphologic criteria that allow melanoma recognition. In the real clinical setting, the dermoscopic diagnosis of melanoma is usually straight-forward, based on the immediate recognition of its morphologic asymmetry and/or a combinationThis glossary term has not yet been described. of the structures described above. Obviously, the dermoscopic morphologyThis glossary term has not yet been described. of melanoma is less evident at an initial stage (melanoma in situnot seen to be spreading from a localized position/early invasive), where only 1 (or even none) of these features might be present. 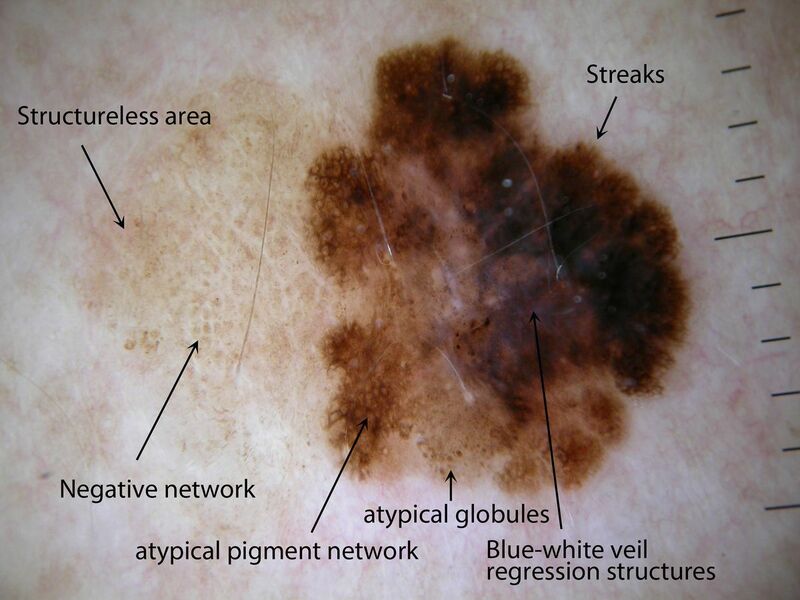 The most frequent criteria of melanoma in situ are atypical networkNetwork with increased variability in the color, thickness, and spacing of the lines of the network; asymmetrically distributed; gray color and regressionThis glossary term has not yet been described..
As the tumor progresses, more dermoscopic criteria develop and the diagnosis is usually straight-forward, based on the immediate recognition of its morphologic asymmetry and a combination of the structures described above. However, less morphologically evident melanomas do exist, and in such cases, an analytic approachThis glossary term has not yet been described. of the lesion is required. 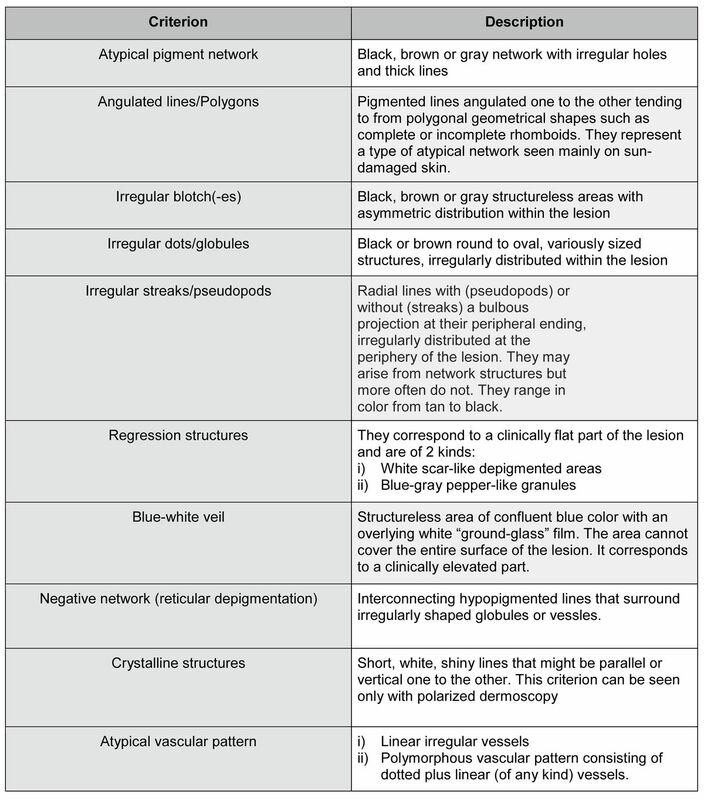 The firstly introduced and more widely adopted method for analysing the morphology of a pigmented lesion is the so-called 2-step algorithmIn mathematics and computer science, an algorithm (Listeni/ˈælɡərɪðəm/ AL-gə-ri-dhəm) is a self-contained sequence of actions to be performed. Algorithms can perform calculation, data processing and automated reasoning tasks., but also other methods do exist. ↑ Vestergaard et al. : Dermoscopy compared with naked eye examination for the diagnosis of primary melanoma: a meta-analysis of studies performed in a clinical setting. Br. J. Dermatol. 2008;159:669-76. PMID: 18616769. DOI. ↑ 2.02.12.2 Argenziano et al. : Dermoscopy--the ultimate tool for melanoma diagnosis. Semin Cutan Med Surg 2009;28:142-8. PMID: 19782937. DOI. ↑ Babino et al. : Dermoscopy of melanoma and non-melanoma skin cancerThis glossary term has not yet been described.. G Ital Dermatol Venereol 2015;150:507-19. PMID: 26184795. ↑ 4.04.1 Argenziano et al. : Epiluminescence microscopy for the diagnosis of doubtful melanocyticThis glossary term has not yet been described. skin lesions. Comparison of the ABCD rule of dermatoscopyThe examination of [skin lesions] with a 'dermatoscope'. This traditionally consists of a magnifier (typically x10), a non-polarised light source, a transparent plate and a liquid medium between the instrument and the skin, and allows inspection of skin lesions unobstructed by skin surface reflections. Modern dermatoscopes dispense with the use of liquid medium and instead use polarised light to cancel out skin surface reflections. and a new 7-point checklistis a type of informational job aid used to reduce failure by compensating for potential limits of human memory and attention. based on pattern analysisThis glossary term has not yet been described.. Arch Dermatol 1998;134:1563-70. PMID: 9875194. ↑ 5.05.1 Argenziano et al. : Dermoscopy features of melanoma incognitoThis glossary term has not yet been described. : indications for biopsy. J. Am. Acad. Dermatol. 2007;56:508-13. PMID: 17113189. DOI. ↑ 6.06.1 Lallas et al. : ManagementThis glossary term has not yet been described. rules to detect melanoma. Dermatology (Basel) 2013;226:52-60. PMID: 23485555. DOI. ↑ Argenziano et al. : SevenThis glossary term has not yet been described.-point checklist of dermoscopy revisited. Br. J. Dermatol. 2011;164:785-90. PMID: 21175563. DOI. ↑ Nachbar et al. : The ABCD rule of dermatoscopy. High prospective value in the diagnosis of doubtful melanocytic skin lesions. J. Am. Acad. Dermatol. 1994;30:551-9. PMID: 8157780. ↑ Menzies et al. : Frequency and morphologic characteristics of invasive melanomas lacking specific surface microscopic features. Arch Dermatol 1996;132:1178-82. PMID: 8859028. This page was last modified on 3 December 2018, at 16:15. This page has been accessed 3,705 times.